Home Assets What is Scrap Value of an Asset? Scrap value of an asset may be defined as the estimated price that can be collected by salvaging or selling the asset after its useful life. In other words, it is the approximated value at which an asset can be sold in the open market after the expiration of its service life. The residual value of an asset is often insignificant or zero. It is also known as salvage value, residual value or break-up value. Scrap value of an asset differs based on the method of depreciation followed by the business .i.e. straight-line method (or) Reducing balance method of depreciation. Related Topic – What are NPAs (Non-Performing Assets)? Scenario 2: Assume that the same company in Example 1 follows reducing balance method of depreciation, there will be a variation in the amount of depreciation and scrap value of an asset. If the residual or salvage value of an asset past its useful life is not insignificant it may keep on existing on the company’s balance (asset side) until the time it’s disposed of. 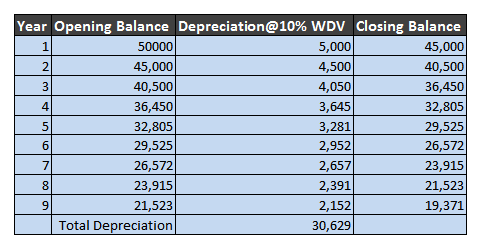 >Read How to Calculate Depreciation Rate For Fixed Assets?